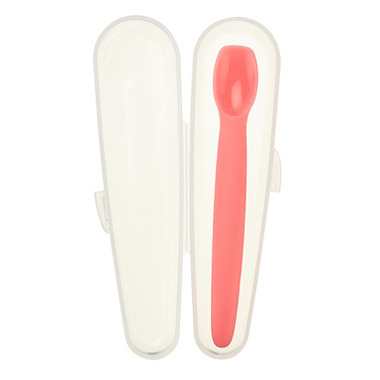 Innobaby Silicone Baby Spoon with Travel Case is a must have in your diaper bag! It is the perfect spoon for introducing new foods and is gentle on sore gums. Spoon is non toxic and safe to babies. Comes with carrying case to keep your baby's spoon clean before use and contain the mess after use. The size of this spoon is perfect for our 5m olds, and it's great that is comes with a travel case. But, the spoon is too floppy. There is absolutely no stiffness to the spoon handle, which makes it hard to impossible to mix baby cereal with, or to use the spoon to clean my babies face of the excess food, if that makes any sense?! ?